Upstate NY customers can reduce your costs with the voluntary time-of-use rate (SC-1 VTOU) by charging your electric vehicle during the off-peak hours of 11pm to 7am. Most EVs can be easily programmed to charge during these hours using an onboard timer, mobile app, outlet timer, or EV charging station. Upstate NY customers can reduce their energy costs by shifting their EV charging – and other appliance use – to the off-peak hours of 11 pm to 7 am. After the first year on this rate, National Grid will reconcile the total amount paid with what you would have paid on the standard, non-time-of-use SC-1 rate. If you would have paid less on the SC-1 rate, then we will provide you with a one-time bill credit for the difference. This reconcilement will only occur at the end of the first year and not in subsequent years. Please see below for more information regarding eligibility for this reconcilement. Every year, on an annual basis, you have the option to stay on the SC-1 VTOU rate or return to the SC-1 rate. To sign up, email us to express interest in the VTOU rate or call 1-800-664-6729, Monday through Friday, 8 a.m. to 5 p.m.
What is the difference between VTOU and TOU? The following FAQS explain some of the differences between VTOU and TOU. Click here to view a table of this information. Who are these rates designed for? Both rates are designed for customers who can shift their electric use to off-peak time periods. Is there a Basic Service Charge? What are the rate periods? What are the supply rates? SC1-VTOU customers are billed for electricity based on kWh usage in the periods outlined in the above question. Customers will be charged the lowest delivery and commodity rates during the off-peak period, higher deliver and commodity rates during the on-peak period, and the highest commodity rate during the super-peak period. How much can a customer save on this rate? Savings are contingent on the customer's ability to shift their use to off-peak time periods. The Time of Use meter records the consumption as well as the time of day and season of the year in which it is used. The Time of Use rate will likely provide you with a savings if you use at least 2500 kwh/ month and can shift 80% of your electric usage to off peak/off season periods. 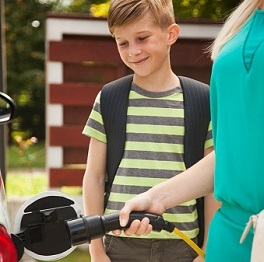 Each customer’s savings will vary based on factors such as the number of EV miles driven, percent of EV home charging, time the vehicle charges (e.g. on-peak, off-peak, super-peak) and the ability to shift other equipment in the home to off peak. For example, a household using 650 kWh per month and 360 kWh per month for off-peak EV charging (approximately 12,000 miles per year) is estimated to save approximately $175 per year. Can I opt into this rate if I am with ESCo? VTOU : Yes. Customers will be charged the applicable on-peak and off-peak delivery rates and supply will continue to be billed in accordance with the terms of your ESCo agreement. However, you cannot be enrolled with an ESCo if you want/have the comparison rate. What if I end up paying more on the SC-1 VTOU rate than the SC-1 standard rate? Available for 1st time customers enrolling in rate. You must provide National Grid with a copy of the EV vehicle registration at your residence.Commodity supply is provided by National Grid, not an ESCo.. If 12 month contract is broken the comparison rate is terminated and no credit will be awarded, if applicable. Customers have the option of receiving a one-time comparison of one year of charges on the SC-1 VTOU services versus the SC-1 standard tariff. The comparison is based on the 12-month period beginning with the bill period following the Company’s receipt of vehicle registration. If you would have paid less on the SC-1 standard rate, excluding the balance of ESRM charge, then the Company will provide you with a one-time bill credit for the difference. How do I enroll in Comparison Rate? Is there a minimum amount of time to stay on the SC-1 VTOU rate? Yes. Customers are required to stay on the rate for one year. At the end of the year customers can opt to move back to an SC-1 Standard tariff rate. Do customers need a special meter? How do I sign up for SC-1 VTOU? Does NG have a TOU or an EV charging rate for MA and RI? VTOU National Grid at this time does not have an EV charging rate for MA and RI customers. How much can customers save on this rate? Each customer’s savings will vary based on factors such as the number of EV miles driven, percent of EV home charging, time the vehicle charges (e.g. on-peak, off-peak, super-peak) and the ability to shift other equipment in the home to off-peak. EV drivers on the SC-1 VTOU rate receiving commodity through National Grid have the option of receiving a one-time comparison of one year of charges on the SC-1 VTOU services versus the SC-1 standard tariff (excluding incremental customer charge of $3.36/month for a new meter and the hedge adjustment component of the Electric Supply Reconciliation Mechanism.) The comparison is based on the 12-month period beginning with the bill period following the Company’s receipt of vehicle registration. If the comparison indicates you would have paid less on the SC-1 standard tariff rate then the Company will provide you with a one-time bill credit for the difference. At that time, and on an annual basis, you may choose to stay on the SC-1 VTOU or leave it. You provide National Grid with a copy of the EV vehicle registration at your residence when enrolling in the SC-1 VTOU rate. Commodity supply is provided by National Grid, not an ESCo. Can I opt into this rate if I am with an ESCo? Yes. Customers will be charged the applicable on-peak and off-peak delivery rates and supply will continue to be billed in accordance with the terms of your ESCo agreement. Yes. Customers are required to stay on the rate for one year. At the end of the year customers can opt to move back to SC-1 Standard tariff rate or to the SC-1C Optional Large Time of Use rate. Yes. SC-1 VTOU customers require a time-of-use meter. SC-1 VTOU customers are charged a monthly $3.36 fee to cover the cost of the enhanced metering necessary to record the usage in the three time periods. For more details, please email us anytime or call us at 1-800-664-6729, Monday through Friday, from 8 a.m. to 5 p.m.
Where can I find more information about the SC-1 VTOU rate components? You can view a full breakdown of the rate components here. Does National Grid have an EV charging rate for Massachusetts and Rhode Island customers? National Grid at this time does not have an EV charging rate for MA and RI customers. Please check back periodically for updates. For more details, please email us anytime or call us at 1-800-664-6729, Monday through Friday, 8 a.m. to 5 p.m.